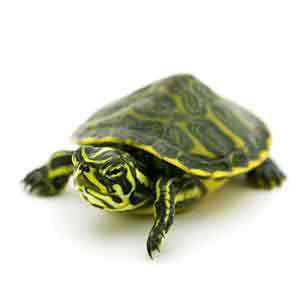 Before purchasing your new pink belly side neck turtle for sale, find the right aquatic turtles for sale breeder. Whether it be a turtle store, or turtle farms, it is important you find the right turtle breeders near me selling captive bred baby turtles for sale only. Our pink belly side neck turtles are all captive bred and raised by hand in fresh, clean water. All of our pink belly side neck turtles for sale come with our full live arrival and 7 day health guarantee. 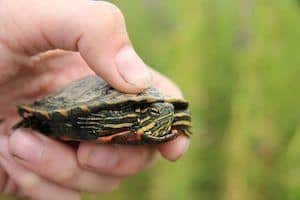 We always recommend the 66-month-oldor yearling well started pink belly side neck turtle over the new, more fragile fresh turtle hatchling for sale. A single pink-bellied side-necked turtle hatchling, at about 4 inches long, needs a 20-gallon aquarium at a minimum. The species does well in groups, provided the size of the enclosure is increased by at least 10 percent for each additional turtle. As the hatchling grows, its area should be increased by 10 gallons for each inch it grows. Adults reach lengths of 8 to 9 inches. If the water isn’t constantly flowing, the turtle benefits from a filtration system to keep its water clean between changing. River sand at the floor of the enclosure mimics the turtle’s natural habitat. Rocks, greenery, cork bark, and partially-submerged logs or other ramps enable the turtle to leave the water when it wants to bask. We have some fantastic, vivid colored pink belly side necked turtles for sale. We have captive bred baby pink belly side neck turtles for sale, captive bred well started 6 month old baby pink belly side necked turtle for sale as well as yearling pink belly side neck turtles for sale. The pink-bellied side-necked turtle (Emydura subglobosa) is a recent introduction to the North American turtle keeping hobby. Its shell ranges in color from beige to chestnut brown or slate gray. The plastron can be white, pink or, in the case of especially prized specimens, bright red/orange. The skin is typically various shades of gray, with some red markings. As pink-bellied side-necks grow, their skin develops additional random red/orange markings. Remember when searching for any tortoises for sale online, including a new baby tortoise for sale cheap, tortoise town is your source for the best cheap baby tortoises for sale, baby tortoises, baby box turtles, and adult turtle for sale online of any turtle stores anywhere. If you are interested in tortoise care, please visit our care section.